Talmud Eser Sefirot, Volume 3, Part 8, Question 36: "Place." Time, motion, and place are practically the same notion, which determines the relative change and renewal of form (desires). However, when we are speaking of the order of the descent of the levels, this is called the change of "place," whereas when we are speaking of cause and effect, it is called "the order of time." Why are time, motion, and place practically the same notion? It’s because they are changes taking place in our desires, Kelim. The will to enjoy undergoes changes. But why do I think and feel one change as the flow of time, and another as a change of place, motion? Why do I perceive everything that happens as changes in time, motion, and place? Isn’t motion a place? After all, if I change my place, it means I am in motion. Yet I am told, "No, this is a completely different category." However, all the categories are changes taking place in the will to enjoy. In relation to what? Only in relation to the quality of bestowal that it has, meaning the degree of its inclusion into Bina. Malchut can become included in Bina in three forms, which are called time, motion, and place." They give Malchut different sensations. What kind? When we are speaking of the order of the descent of the levels, meaning the successive changes of states, this is called the change of "place," which is when one’s level or inner state changes. Whereas when we are speaking of the cause and effect, of what happens first and what happens next, meaning that it is not the places that change, but their order, it is called "the order of time." And if we speak about what kind of state was present in every place, this is called "place." Baal HaSulam, “Thou Hast Hemmed Me In Behind and Before“: Thou hast hemmed me in behind and before, meaning the revelation and concealment of the face of the Creator, for indeed “His kingdom ruleth over all,” and everything will return to its root because there is no place vacant of him. But the difference is in present tense or future tense, because he who connects the two worlds, discovers in the present His clothing: that everything that is done is a clothing for the revelation of divinity. All events, from the beginning to the end, are sent by You and are aimed solely to open my eyes and bring me back to the Source. And there is no place where You don’t rule so that I may say that I acted on my own or someone else stood for or against me. Everything is permeated by the Light of Infinity, the Creator; therefore, there is no act, thought, or step that would not be completely controlled by Him. And all of it has only one purpose: to get us to attain Him so that we come closer to Him, know Him, cling to Him, and accept His governance. We need to become like Him and walk with Him further, agreeing with all His actions and copying all His moves to such an extent that we would be able to predict what He is going to do and wish to do it before He does. It turns out that it is my desire to make it so, and He is the one who does it after me! A person reaches such subtle understanding and perception of all this system that is being revealed to him that he completely unifies with the Creator. I anticipate what the Creator wishes me to do, and like a small child who pulls the grownup by the hand, so do I move the creature toward perfection. Clearly, in this case we annul time. There is no more past, present, or future, and we ascend to the state where everything takes place at once and simultaneously. The future gives way to the present. And this is deemed present tense, meaning that now too he comes out in royal clothes [also in Malchut’s clothing] and evidently shows that the rider is not subordinate to the horse. But although it seemingly appears that the horse leads the rider, the truth is that the horse is provoked to any movement, only by the sensation of the bridle and headstall of the rider. And that is called the construction of the stature of divinity, and it is also called face-to-face. The reality in which we exist has no time. All of the changes of time, space, actions, and everything that happens to us including our own transformations are all based on our changeable sensations, while nothing changes outside of us. We would not feel any changes without the changes in our desires and intentions. In reality there is nothing but the desire with intention and opposite to it, the Upper Light that remains at absolute rest. As this desire changes, it experiences different forms and shapes. Presently, we are experiencing the sensation of ourselves, and this is also the desire that perceives itself this way. This desire goes through different states, one after another, in the order of cause and effect, from the beginning of its development to the end. This entire development is only realized in relation to the desire; there are no changes outside of it. Therefore, the entire wisdom of Kabbalah speaks only about the way the desire perceives its reality: the location of this desire, why it is there, and who it is connected to. This is its entire life. The wisdom of Kabbalah reveals to us all of the events that happen to the desire, explains this entire process and especially the last stage of the desire’s development. This last stage is a conscious step, when the desire develops together with its intention and they attain a state where they begin to perceive their own reality. A certain force arises in them, a special property of perception, which enables the desire to rise over it and watch itself from an external and objective point. Then the desire establishes that it actually exists; it changes and moves towards something, existing in connection with someone unknown for now, and there is a purpose to its development. It begins to think about the future state which it does not yet see. All of this happens because the so-called “point in the heart” develops in the desire on the last stage of its development. From this moment on, the desire begins to identify itself more and more with this point; it connects with it, values it, and moves outside of itself more. In other words, instead of paying attention to the things that the desire has or doesn’t, to the degree to which it is filled or empty, it begins to see fulfillment or its absence as the means to identify itself more with the point above the desire referred to as the screen or intention, Creator, or unity. This is how the desire develops. Our entire reality is divided into two parts: the unveiled one that we are aware of and the concealed one that we know nothing about. Through advancing conventional science, we can certainly broaden our knowledge of the evident part of reality, but only through refining the same five sensory organs we have always had and nothing more. However, this will not allow us to make a quantum leap and discover a new dimension. Kabbalah says that we can develop an additional sense that will allow us to perceive the reality beyond. Yet, we should be aware that we will find it opposite to the one we see today. Currently our perception of reality depends on our ability to absorb it by means of our five corporeal sensory organs: sight, hearing, taste, smell, and touch. The sensations supplied by these organs are called our world. But we have an ability to develop additional perceptions. 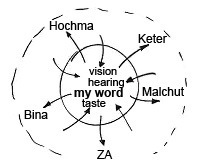 It doesn’t mean to receive additional arms, legs, tastes, or such, but to step outside our self through developing another five organs of perception: Keter, Hochma, Bina, Zeir Anpin, and Malchut. In these extra organs of perception, which are completely opposite to the corporeal ones, we begin perceiving all that takes place outside of us. This means that our perception becomes limitless and we exit into an endless open space. We see all the worlds. Our ability to perceive them depends solely on how developed our spiritual organs of perception are. We are not limited to our body which is bound by how much we are able to consume till satiated. Now everything depends upon how far we can expand. We then begin to grasp all forces, thoughts, desires, tasks, and the purpose of creation: the whole world around us. We begin to understand what is happening within us. In contrast, without this knowledge, we will never understand what is happening around us and how it impacts us, neither in the world nor within our self. The science that teaches how to step out of self and unveil life in the Upper dimension is called the wisdom of Kabbalah. When we finally exit our ego and begin exploring the universe, we discover the purpose of creation, why everything exists. When we step out of our self, we break free from the restrictions of our tiny body and rise above time, motion, and space; that is, we rise above the corporeal perception of reality in its three axes of coordinates: up-down, left-right, back-forth. We stop experiencing time for there is no time in that reality. We see other causes and effects, meaning that we receive absolutely new properties and abilities, outside of the connection to our animate body. In the same manner as we are able to see, sense, and understand a person directly in front of us, we have to know and comprehend the whole of reality called the Creator or the Upper Force. Hence, we will feel worse and more restricted in our limited reality until we find a way to step out of it into the open world! Question: Will I be better off if everybody else is well? My Answer: Yes, because you are part of everybody else, the only way you will truly be well is if all others are well. Question: How can I stop wishing others well egoistically, and start wishing them well altruistically? My Answer: Only the Upper Light can do it! Question: Why is the Creator so selective toward the creations? Why are certain people or nations chosen? Why didn’t He create everybody equal? My Answer: Precisely so we could help one another to attain Him. Question: What is mutual bestowal to the Creator? My Answer: From everyone according to his ability. Question: I feel that the World Kli has long been trying to unite for the Creator’s work. If this is the purpose of creation, why doesn’t this infinite fulfillment for His sake take place? My Answer: We are in the process of forming this unified desire. Question: Quote: “According to Rambam, we see that everybody must come to the state of Lishma, the only difference being the time when it happens.” Why time, and not effort? Why are these types of “mistakes” not entirely uncommon in the Kabbalistic texts? My Answer: Because effort refers to actions, whereas time refers to the realization of these actions, their result. A Question I Received: When I read The Zohar, my mind keeps seeing superficial images. How can I remember that all these things are happening inside me as the text speaks about connections between us? My Answer: To tell you the truth, it doesn’t matter. "Time does what the mind does not." The time is for studying and growing closer with the friends. When, during the lesson, a person isn’t able to think (with his head) about the goal (with his heart), let him listen to his heart. Most important is to constantly hold on to the thought of what you want from the study. Torah does not have an affect without this. The Torah influences according to one’s intention. As it is written, "I created the evil inclination and gave the Torah as a spice." Do you have an evil inclination? Bring it and then you’ll receive the Torah as a spice to it (the means for its correction). However, how does having this spice help you if you lack the evil inclination? Kabbalists give us simple examples. Do you have soup? Would you like to add pepper, salt, and all kinds of seasoning? Go ahead, but how will you benefit from having salt and pepper if you don’t have the soup? By themselves, salt and pepper taste disgusting. In our case we first need to prepare the "soup." Without it, there’s no need to ask for seasoning; we wouldn’t even be able to ask for it. It’s during the process of making the soup (in the group) that the need for seasoning arises (for the Light to unite us). Only those who need Torah have (discovered) the evil inclination. This is why we need to approach the reading of The Zohar and all our lessons with the proper intention, with knowing exactly what we desire, or, in other words, with a prepared evil nature. With the evil revealed in you, you have something to correct; you will receive correction for it. If you haven’t discovered the evil within, you first need to look for it. If you feel righteous, the Torah is not for you; it is for the sinners for their correction. This is why the one who is greater than the others is the one who discovers a bigger egoism within, a greater evil, and he has something to correct. Thus, it doesn’t matter how much one understands during the lesson. "It’s not the wise who studies" (Lo ha-Hacham Lomed). What matters is feeling that one has something to correct in the connection with his friends. We need to unite into one desire, the soul of Adam, and we must become brothers in our goal. Even though we now hate one another, don’t want the others, and disdain them, we understand that unity is the goal. This is why we wait for the Light to come and bring us back to the source where we will become one complete desire, and the Creator will become revealed among us. The Zohar: "The Intention in the Prayer"
A question I received: We live our lives in hopes and never achieve pleasure. What will happen when we acquire the desire to bestow? Will we be able to feel pleasure then? My Answer: When we transform the egoistic intention into the bestowing one, time ceases to exist. The very notion of time disappears because there is no past, present, or future in spirituality. Being in the attribute of bestowal, we don’t inquire about cause and effect. We delight in the act of bestowal that we find ourselves in, needing nothing else. Having the opportunity to bestow is our reward. But don’t we care about the results of our actions? An opportunity to bestow is the result. For this reason, the concept of time disappears and everything is at absolute rest. Egoism promises us the future, while in spirituality, there is no future; everything happens in the present. The future is felt only if I reveal the lack of bestowal in my current state, only if I want to bestow more and aspire to it. It’s as if I desire to go from the small World of Infinity to the big one. This, too, is possible only through “magic,” through egoistic desires that are helping me. They reveal to me the deficiencies of my state, the impurity of my bestowal.